Shatavari is a natural remedy long used in ayurveda (the traditional medicine of India). Sourced from the Asparagus racemosus plant and available in dietary supplement form, shatavari is said to offer a variety of health benefits. Preliminary studies suggest that shatavari may contain a number of compounds with health-promoting effects, including several types of antioxidants. 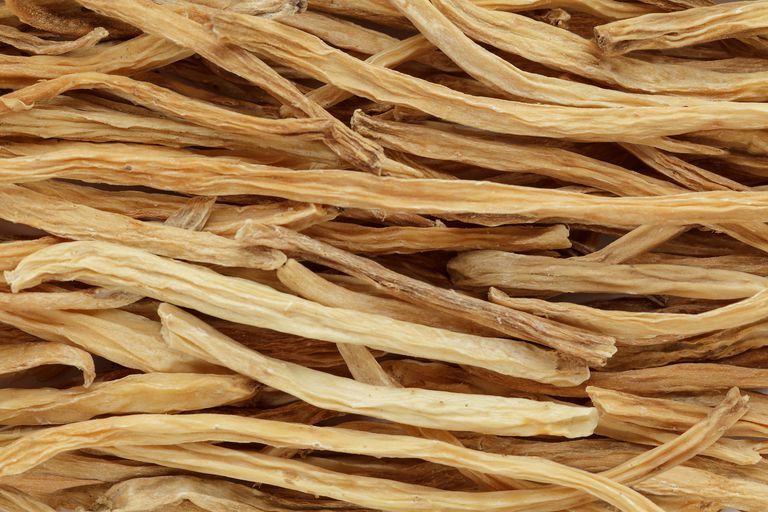 In addition, shatavari is said to alleviate pain, support alcohol withdrawal, sharpen memory, boost the immune system, and protect against cancer. Shatavari is also thought to act as an aphrodisiac, as well as stimulate the production of breast milk in nursing mothers. According to practitioners of ayurveda, shatavari possesses cooling, calming properties that can help to soothe and balance vata and pitta (two of the three doshas). Often used to enhance reproductive and digestive health, shatavari is also said to have rejuvenating and nourishing effects. Shatavari shows promise in the treatment of diabetic nephropathy (a type of kidney damage thought to result in part from poor control of diabetes and blood pressure). In a study published in the Indian Journal of Experimental Biology in 2012, tests on rats revealed that treatment with shatavari helped protect abnormal changes in kidney tissue. In addition, shatavari significantly decreased cholesterol and blood sugar levels and reduced oxidative stress. Several preliminary studies indicate that shatavari may help treat gastric ulcers (a condition that occurs when the protective lining of the stomach breaks down and fails to fight off irritating acids). In a rat-based study published in the Journal of Herbal Pharmacotherapy in 2006, for example, scientists determined that shatavari may help treat gastric ulcers by curbing the release of hydrochloric acid. Related: Find out about natural and herbal remedies for heartburn. Due to a lack of research, little is known about the safety of long-term or prolonged use of shatavari. Since shatavari is related to asparagus, it should be avoided by individuals with an allergy to asparagus. In addition, shatavari is thought to contain phytoestrogens (a class of compounds with estrogen-like effects). Therefore, anyone with hormone-sensitive conditions (such as breast cancer, endometriosis, and uterine fibroids) should avoid the use of shatavari. It's important to keep in mind that supplements haven't been tested for safety and dietary supplements are largely unregulated. In some cases, the product may deliver doses that differ from the specified amount for each herb. In other cases, the product may be contaminated with other substances such as metals. While consumers face such risks when purchasing any dietary supplement, these risks may be of greater magnitude in the purchase of Ayurvedic products (particularly those containing a variety of herbs). A number of other herbs used in ayurvedic medicine have been found to have beneficial effects on human health. For instance, there's some evidence that guggul may help keep cholesterol in check, while boswellia may protect against ulcers. Learn more about ayurvedic herbs. Widely available for purchase online, shatavari can be found in some natural-foods stores and stores specializing in dietary supplements. Due to the lack of research, it's too soon to recommend shatavari as a treatment for any condition. It's also important to note that self-treating a condition and avoiding or delaying standard care may have serious consequences. If you're considering using shatavari for any health purpose, make sure to consult your physician first. Bhatnagar M, Sisodia SS, Bhatnagar R. "Antiulcer and Antioxidant Activity of Asparagus Racemosus Willd and Withania Somnifera Dunal in Rats." Ann N Y Acad Sci. 2005 Nov;1056:261-78. Bhatnagar M, Sisodia SS. "Antisecretory and Antiulcer Activity of Asparagus Racemosus Willd. Against Indomethacin Plus Phyloric Ligation-Induced Gastric Ulcer in Rats." J Herb Pharmacother. 2006;6(1):13-20. Goyal RK, Singh J, Lal H. "Asparagus Racemosus—An Update." Indian J Med Sci. 2003 Sep;57(9):408-14. Somania R, Singhai AK, Shivgunde P, Jain D. "Asparagus Racemosus Willd (Liliaceae) Ameliorates Early Diabetic Nephropathy in STZ Induced Diabetic Rats." Indian J Exp Biol. 2012 Jul;50(7):469-75.